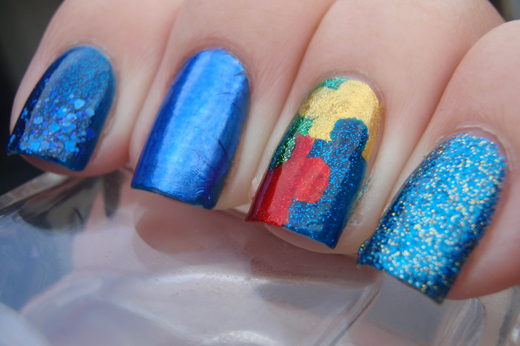 I finally got my self organised enough to put together a blue mani for Autism awareness. I pulled out some of my favourite blue shades and created a skittles mani. On my thumb is Picture Polish Cosmos. On my index finger is Pretty Serious BSOD with a glitter gradient of Lynnderella Once in a Blue Rune. 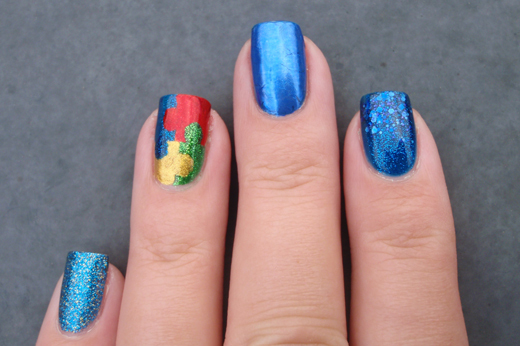 The middle finger has a plain metallic blue nail art foil and the pinky has OPI Absolutely Alice. 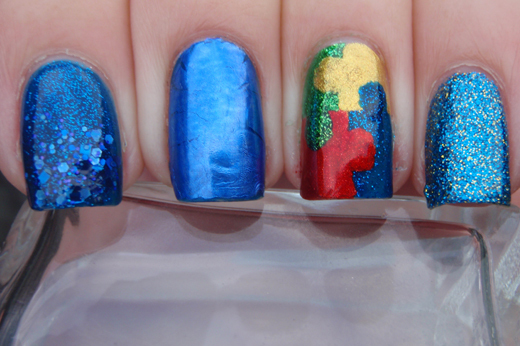 On my ring I created the Autism Awareness jigsaw pieces using Pretty Serious BSOD and Santa's Sunburn, Kleancolor Metallic Yellow and China Glaze Running in Circles. 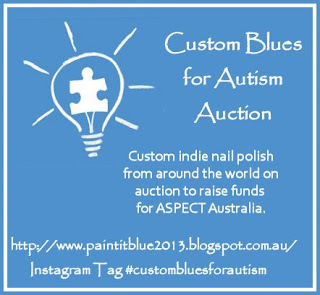 The other thing happening later this month is an auction of a whole range of custom blue nail polishes to raise money for ASPECT Australia. The nail polishes have been specifically created only for this auction from some generous Australian and international indie brands including: Gloss 'n Sparkle, Love they Polish, Emily de Molly, Femme Fatale, Shades of Pheonix, Nerd Lacquer, Lynnderella, Pretty Serious, Sayuri, Pretty & Polished, Dollish Polish, Loony Lacquer, Deadset Babes, Alanna Renee, Different Dimension and Loki's Lacquer. Wow, thats quite a list. I'll let you know when the auction is open for bids, I believe it will be a silent auction where you will submit your best bid for your favourite polishe/s via an online store. 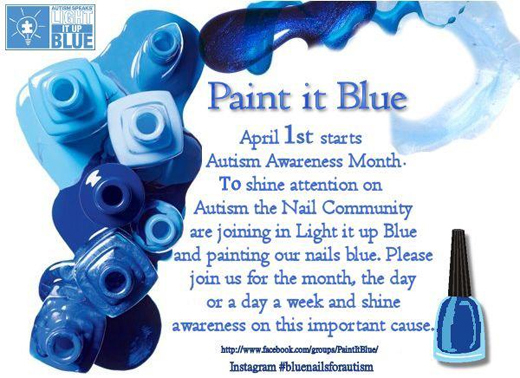 I've got a number of other blue manis planned for this month, so when I saw the below inlinkz for Paint it nails I thought I would add mine and encourage others to add theirs. I think the manicure is gorgeous! This is very pretty! 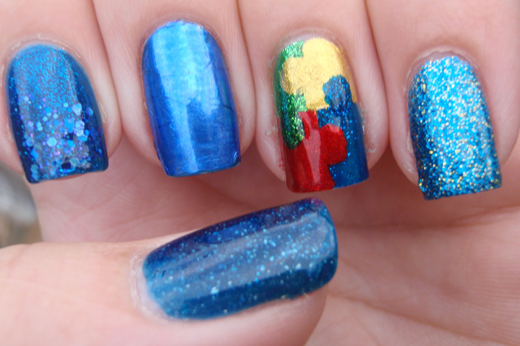 AA is my favourite nail; I must wear this myself sometime this month!